First introduced in 1986, the Jeep Wrangler has been one of the most popular and successful off-road vehicles in the country. The Wrangler has done one thing very well: it offers an off-road experience for anyone who wants it by bringing the style of Jeep craftsmanship into the mainstream auto market. Over the years, different generations of Wranglers have created a thriving market of buyers all looking for just the right used Jeep Wrangler to fit their needs. The first generation of Wrangler, referred to as YJ, was introduced in 1986 and was available until 1995. This marked the beginning of the “Wrangler” name, which replaced the term “CJ” or “Commercial Jeep.” These are the first Wranglers, only available in 2-door styles, and are quite popular among people looking for a used Jeep Wrangler for sale. The second generation of Wranglers is referred to as “TJ” and first became available in 1996 for model year 1997. These are often raecognized, compared to the previous generation, by the circular headlights that they brought back, after the square headlamps of the YJ series. This generation was also exclusively a 2-door style, though it introduced the “Unlimited” series, which had a longer wheelbase. Perhaps the biggest year for the JK generation of used Jeep Wranglers; this is the first and initial release year for the JK. It was launched with two different models available, both with a 3.8L EGH engine: a standard 2-door version with a short wheelbase, and a 4-door model that has a long wheelbase. The 4-door model was called the “Unlimited” throughout this entire generation, and both models were available in 2007 in four different trim levels: X, X-S, Sahara, and Rubicon. There were hard-top and soft-top versions of these Wranglers available, so you can typically find used Jeep Wranglers for sale with either of those options. The Sahara and Rubicon trim levels also had half-doors available in addition to the standard full doors. In general, the Sahara was the luxury model within this generation, while the Rubicon was the off-road ready version, so keep that in mind as you look at different used Jeep Wrangler models. The Jeep Wrangler available in 2008 was very much like the previous year, with little in the way of upgrades or improvements. Just like in 2007, there were standard and Unlimited models manufactured and they had the same 3.8L EGH engine that was introduced in the 2007 model. When you look at used Jeep Wranglers for sale, you can more-or-less consider the 2007 and 2008 models the same in terms of available features and functionality. Collectors who want the first model year will gravitate toward the 2007s, but if you just want something to drive, then the 2008 is just as good. There were some slight improvements and upgrades made for the 2009 model year, so keep an eye out for these used Jeep Wranglers for sale. Most of the changes were safety upgrades, which makes this a great year if you want an early JK model but also want great safety features. These upgrades include things like hill start assist to help keep you from rolling downhill. Trailer sway control was also introduced to help with towing a trailer or camper behind the Jeep, along with electronic stability alerts for trailer sway. Trim levels were also slightly changed starting with the 2009 model year. The trims previously called “X” and “X-S” were renamed “Sport” and “Sport S” for both the standard and Unlimited models. As such, used Jeep Wranglers from 2007 or 2008 can have different trim names than those from later years within the JK generation. Although the upgrades in 2010 were not as major as the safety improvements that mark used Jeep Wranglers from 2009, there were still a few important changes. 2010 saw the release of a new soft top that was easier to fold and open than the one found on models from previous years. The 2010 Jeep Wranglers also included new sun visors that offer more coverage and a UConnect infotainment system that became standard. Overall, not a lot of huge changes, but the soft-top improvements alone make this a popular year. Model year 2011 used Jeep Wranglers are quite popular for a number of reasons, including an updated interior that made for a more luxurious experience overall. The redesigned interior included a USB interface and Bluetooth support for streaming audio content. Automatic temperature controls were added as an option to the 2011 Jeep Wrangler, which makes them quite popular on the used market, and the interior redesign also addressed issues with noise. Second only to the initial release year of 2007, 2012 marked the biggest improvement and change to the JK generation of Jeep Wranglers. In 2012, the engine was changed from the older 3.8L model to a greatly improved Chrysler engine: the 3.6L Pentastar V-6 engine that provides more horsepower and torque than the previous engine did. While some people were critical of the engine in the JK’s initial release, this silenced just about all of that criticism. For people looking for used Jeep Wranglers for sale, 2012 is a major year and one worth looking for. Any model year after 2012 includes the 3.6L Pentastar engine, so keep that in mind as you consider your options. After the introduction of the new engine in 2012, the 2013 models had only minor improvements, as you might expect. These were largely aesthetic in nature and included contoured seats and new trim details inside the vehicle. A lever was introduced that allowed for rear-seat folding using only one hand – previously it required two hands – and ambient lighting was introduced in the cabin. Overall, however, 2013 used Jeep Wranglers are quite similar to those from 2012. Changes introduced in 2014 were also quite limited in scope and were largely minor. They included a new Trail Kit that became available, which included a pair of D-rings and a tow strap. Clear turn signal indicators and park lamps replaced the amber lamps from previous years, and six new body colors were introduced in 2014, including Copperhead and Flame Red. Interior features available on some used Jeep Wranglers from 2014 include a 6-inch touchscreen with hard drive storage and other technology upgrades. 2015 saw the addition of even more body paint colors, including a dark olive green shade referred to as Tank, Baja Yellow, and Firecracker Red. An 8-speaker audio system became standard in 2015 Jeep Wranglers, and a 9-speaker system with a subwoofer was also introduced. Additional improvements were similarly minor in nature, such as a package that included 31-inch tires and a standard Torx tool that made it easier for owners to remove the doors. Most of the upgrades and improvements in the 2016 Jeep Wrangler were aesthetic in nature or very minor. This included greater comfort in the driver’s seat thanks to a more ergonomic design – something that often took second-place to the more “Jeep-like” design features of previous years. 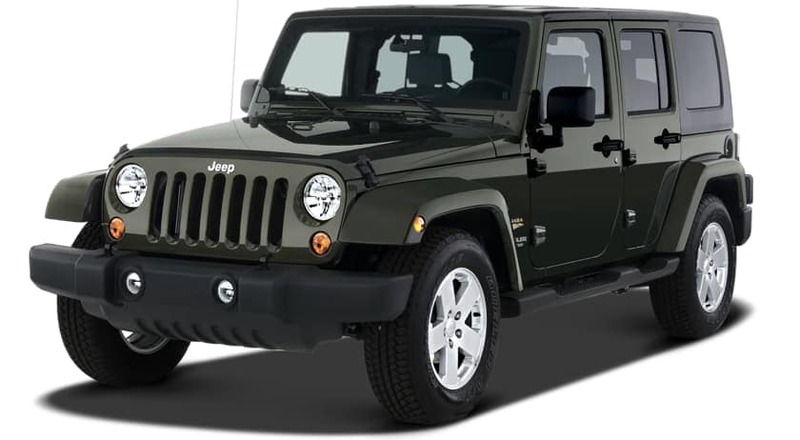 Overall, 2016 used Jeep Wranglers are very similar to 2015, with only a few minor differences, beyond some special editions only available during certain years. This includes the 2016 Black Bear Edition – which built upon the standard Sport trim level, but added features based on Black Bear Pass near Telluride, Colorado. In 2017, the JK generation came to an end, so improvements and changes were quite limited. Perhaps the biggest change was the introduction of LED headlights and fog lamps as standard features in the Sahara and Rubicon trim levels, and available options for the Sport model. A cold weather package also became available in 2017, which included an engine-block heater, heated seats, and similar features aimed at driving in cold weather. Otherwise, used Jeep Wranglers from 2017 are quite similar to the previous year. Of course, collectors might focus on getting one of these models to mark the end of an era. 2018 models, on the other hand, mark the beginning of the JL generation with an impressive redesign and an array of new features for a new generation of used Jeep Wranglers for sale. At McCluskey Auto, we have a wide range of used Jeep Wranglers for sale, with an inventory that changes and updates all the time. We know the feeling of getting behind the wheel of a Jeep, having the paved road slip away, and feeling the unlimited bounds of freedom and exploration open up before you. That’s what a Jeep Wrangler is all about, no matter what generation or model year it came from. When you are looking for a used Jeep Wrangler for sale, come to McCluskey Auto and see what we have to offer. Our team of professional salespeople is here to answer your questions and always treat you with the honesty, respect, and appreciation you deserve. Let us guide you through every step of buying the used Jeep Wrangler that is perfect for you, so you can drive away happy.